I've been viewing some content on Miro (formerly known as Democracy Player) and I found at the top of my "New" list a video from Trucker Tom on Casa Bonita. For those of you not in the Denver area, but have seen South Park, it's that Casa Bonita. Casa Bonita was one of the first places I was taken when I came to Colorado and it is a memorable place. For those of you who give a rip about "HD" content, Trucker Tom does his stuff in HD. In fact, Miro say that they have more HD content than anyone. Okay, so I'm not a tortured soul, even though I do have musical tastes that include gothic and industrial. But Halloween is my favorite holiday, so Soma FM's doomed station goes perfect with the season. I just may have to send them $50 and get a t-shirt in the bargain since I've been listening to this station a lot off and on the past week...their mix goes *perfect* with the season. Anything that has Coil in the set list gets my approval. Real horrorshow. Speaking of Halloween, I went looking for Masters of Horror on VOD because I thought that season 3 would have started by now. Turns out that Showtime didn't pick up Season 3. Ack, I was hoping it would be a yearly tradition that would run for a while. Oh well, there's always Fearnet and Fear Fest. I've been doing the vegetarian thing for about a year now. It wasn't really that hard to make the switch - I had already cut out the beef and the pork years before, and was only eating poultry and fish. Making that last step was only really difficult for group situations, like work. I still get the occasional snarky comment from people (all men, it so happens) but I think I can ignore the ignorant without too much worry...I'm not sure why it is, but men sometimes have to make mention of how much they need a big steak, etc., upon hearing that I'm vegetarian. I think it has something to do with being insecure in their manhood or something. The idea that having a steak makes a man more manly is of course retarded. I've seen women eat steak, bacon and hamburgers and NONE of them spontaneously changed genders. Funny, that. Of course, advertisers know that many men suffer from such fragile egos and prey on just that to sell meat. I saw a giant ad in Rolling Stone that showed slabs of meat, with the title that says, "We love vegetarians" with message further down that says "...more meat for us". Hardy-har-har-har. Yep, keep preying on those fragile egos. Maybe this ad targets women, too, but somehow it seemed more for the men. Anyway, I switched for a plethora of reasons. One is that I've been uncomfortable with eating animals since forever - and that was before getting information on the horror that is factory farming. But I think the health reasons finally pushed me over to vegetarianism. Alternet had a good article on 15 reasons to switch. I doubt this will change many minds, but it does provide a nice summation of why someone might want to consider at least reducing their intake. 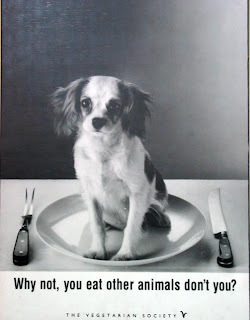 As for the picture, that was probably one of THE reasons I finally switched - the sheer arbitrariness of eating some animals while others, at least in America, people shudder to think of eating. Like cats, dogs, and horses. Virtually everyone working for the corporate world has probably been subjected to one unscientific personality test or another. It's almost guaranteed that you aren't told how unreliable and almost useless those tests are. 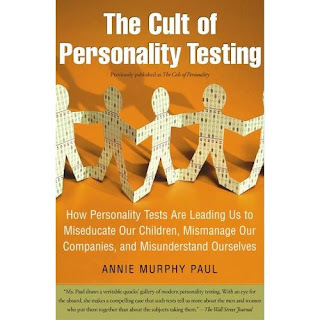 Recently, I already had The Cult of Personality on hold, and found out we were going to be subjected to a round of tests where I work at. This time it was DiSC, but often it's something like Myers Briggs. When I groaned aloud about it when someone asked if I was "excited" about it, I said it's just modern-day phrenology. Which just sort of got a blank look. When I tried to explain phrenology, she just sort of spaced out. It turns out I was attacking her personal belief system, because she's apparently a big fan of personality tests. Well, it turns out this book started off with a discussion of phrenology. It progresses through ink blots and others on up to Myers Briggs. I had to chuckle because this book discussed people (esp. managers) that love the tests so much that they put their type on their business cards. After our round of tests, we had at least one individual that put it in their email sig. One meme I took away from this book is that the reason they remain so popular is most likely due to the Barnum effect - these personality descriptions read a lot like horoscopes. One of the smarter guys (and a real smart aleck, in a good way) asked the person administering the test, if they've ever tried studies where everyone got the results of the person next to them, and studied whether people agreed with the descriptions. I highly suspect he was thinking along the lines of trying to rule out the Barnum effect. Of course, if you have a lot of money to make from administering these tests, you really aren't going to work too hard to debunk them. So the answer from the test giver was "I don't think so", and a frown. Fans of Myers Briggs might be surprised to learn the manner in which it was developed, and just how unreliable it is. Bop on over the the Wikipedia page and read the "validity" section and the reliability section. Very interesting, indeed. Anyway, if you've been skeptical of these tests, I suggest reading this book.